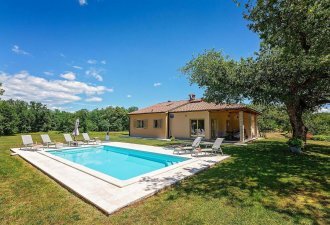 Villa Martina is a newly built, nice single storey home in the quiet village Belavići, on the east coast, only 20 minutes’ drive from Pula. In the village there are only family and holiday houses, the nearest restaurant is 2 km, a shop 7 km and the beach 6 km distant. On completely enclosed property of 600 sqm the guests can use a swimming pool of 28 sqm with sun deck and sun chairs, lounge set, covered terrace with dining table for six people and portable barbecue, children's playground and two parking spaces. This cosy and spacious holiday home extends on 110 sqm living space and can accommodate 4 to 6 people. It consists of a bright and comfortable living room, dining room for 6 people, modern and fully equipped kitchen with exit to the terrace and pool, a shower/WC in the hall, two bedrooms with double bed, one of them with private bathroom. The bedrooms are air conditioned and equipped with satellite TV, ambience lights and work space.